Yesterday I posted on the Treasury Department report on the Chicago housing market which characterized the market as "fragile". However, that report seemed to focus on the hardest hit parts of this market and the most distressed homeowners. It makes sense, given their agenda. However, now that I've pulled the March transaction activity for Chicago it's apparent that the housing market is continuing to look brighter. The official data from the Illinois Association of Realtors won't be out for another week and a half but I can tell you now that it will likely show a 12.1% increase in closings over March of 2011. Of course, that's not as strong as March 2010 when the government was paying people to buy homes but it was higher than 2009. Before 2009 the last time sales were lower than this level was 1998. That's a long time ago. Talking to other agents in the city it's clear that activity is on the rise and it is evident when you look at the contract for the first 3 months of the year. It has been tracking pretty close to 2010's abnormally stimulated levels and well above 2011 and 2009. 24% more contracts were written in March 2012 than March 2011 and that's after adjustments for expected contract terminations. 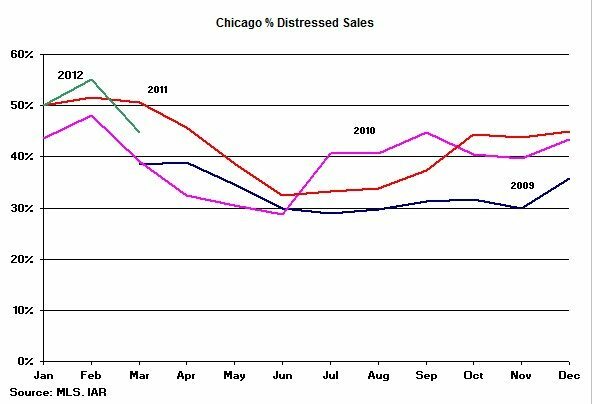 March distressed sales fell to 44.7% of total sales, which was below 2011's level, although it was well above 2009 and 2010 levels.